Football can be a cruel game..
Thousands of supporters travelling the length and breadth of the country midweek only to see their team defeated. Tom Heaton is left on his knees after Ipswich Town's Freddie Sears opens the scoring. That was the case for Carlisle fans who saw their side hammered 4-1 at Home Park against Plymouth Argyle. And it was the same for the near 500 Clarets who made the journey to Portman Road to witness Ipswich Town take maximum points on a miserable Tuesday evening. In a quiet and cagey first half, Michael Kightly went closest to breaking the deadlock when his effort hit the inside of the post. The winger cut past Luke Chambers from the left hand side and, after seeing his initial effort blocked, struck the rebound in to the turf and against the upright before the ball rolled fortuitously in to the arms of goalkeeper Bartosz Bialkowski. Cole Skuse’s ambitious drive from distance rose over the bar as the home side responded while Daryl Murphy, who netted 27 times last term, ballooned an effort over the bar when found by Jonas Knudsen. 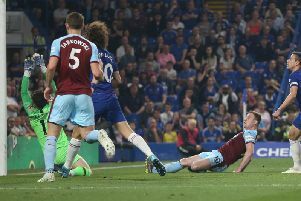 After George Boyd powered a volley over the bar, Freddie Sears fired straight at Tom Heaton from the edge of the box after being gifted possession by Tendayi Darikwa. Before the break, Bialkowski beat away Jelle Vossen’s side-footed attempt from the edge of the box after being picked out by Kightly before David Jones’s set-piece dipped beyond the far post. With David McGoldrick already replacing Ryan Fraser and Brett Pitman coming on for Chambers at the start of the second half, Town had a plethora of goalscorers at their disposal. And they didn’t disappoint. Sears and McGoldrick went on to score while Pitman claimed an assist as Town went on to win the fixture 2-0. Defender Tommy Smith should’ve done better from Ainsley Maitland-Niles’s corner but failed to adjust his head in time to turn the ball in Heaton’s direction. McGoldrick also missed the target with a header after Pitman flicked the ball in to Maitland-Niles’s path for the winger to provide the delivery. Burnley boss Sean Dyche introduced new man Rouwen Hennings after the German received international clearance, but the striker was offered limited service. Instead it was the hosts who made the breakthrough. In the 66th minute Sears guided Pitman’s low cross in to the far corner from close range and five minutes later McGoldrick, unchallenged, doubled the advantage when tucking a header in-between the woodwork and Heaton from Maitland-Niles’s corner. Michael Keane almost halved the deficit late on but his header from Kightly’s corner was superbly kept out by Bialkowski. And at the sound of referee Simon Hooper’s final whistle, Town went top of the Championship as the Clarets slipped to 17th.